Three years since the triple disaster occurred, many Tohoku residents are still being affected and therefore the Japanese Language programme and the department of Asian Studies would like to send some encouraging words to let them know that we care—they have not been forgotten and they are not alone! 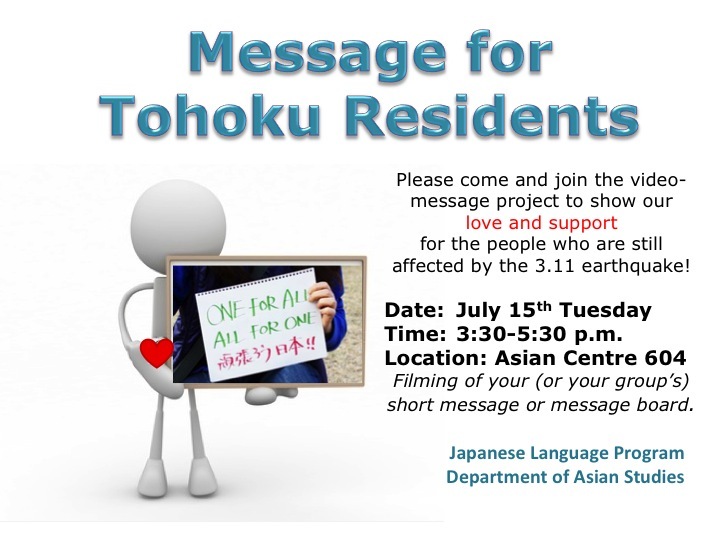 Please come and join us on July 15 if you would like to send your own message to the people of Tohoku! 1. Video messages and yosegaki gathered from UBC students: taken at ourJapanese Language Program Open House (held on March 22, 2014). One more shooting has been scheduled for July 15 (Tuesday) for students taking summer courses (from 2 to 2:30 pm) and all other students who have missed the Open House (from 2:30 to 5:30 pm). — A koto-performance performed by by Kozue Matsumoto (a UBC graduate and a Tohoku region resident before she came to Canada) at the OpenHouse on March 22. —A message from a former student who is now working as a CIR in Fukushima Prefecture. — A message from Professor David Edginton, Department of Geography,who has been tirelessly conducting research in the Tohoku region since the earthquake occurred three years ago. The video clips will be edited and put into a DVD. It will be sent to various people/organizations in the Tohoku region, including Fukushima University (the students there visit those who are still living in temporary housing frequently), Tohoku University, Kahoku Shinpo (the most popular local newspaper in the Tohoku region) and some other city offices or non-profit organizations. (some of the organizations may be putting it on their website). If you are unable to come to UBC on July 15, you are most welcome to send your video clip to Rebecca Chau (rebecca.chau@ubc.ca). We would be most happy to include it in the DVD.